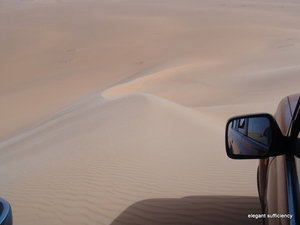 We drove through wadis, along ridges, over dunes in two 4WDs, expertly driven by two young drivers from Sebha. Most of the time, there was nothing but sand, although in the wadis (valleys) were a few scrubby bushes and the occasional palm tree. We stopped at four of the Ubari lakes, where there were groups of Tuareg merchants with tables full of silver jewellery, bright pieces of fabric for wrapping on the head and other bits and pieces. 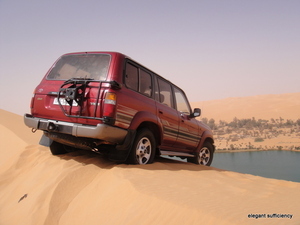 The landscape is truly magnificent, the temperature comfortably warm and the driving terrific fun! 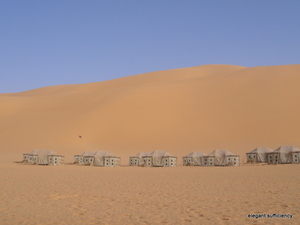 We arrived at Camp Alawi in the late afternoon, in time to shower and wait for the sun to go down. Alcazar, a friendly Tuareg chap made us a cup of Libyan tea (strong, sweet, delicious) and we enjoyed the peace and quiet of a night in a tented desert camp. Of course, I took hundreds more photos, so as before, here's a slideshow.